Information is everything, everything is information even nothing is information, nothing is part of everything. The most basic information is the elementary particle. Can we unite modern understanding of information with steam engine physics? Of course the ultimate of steam engine physics is entropy, particularly the second law of thermodynamics. The first law of thermodynamics states that energy can not be created or destroyed, it merely changes form. The second law of thermodynamics says that entropy of a system increases with time. Energy for doing work decreases as the system becomes more stable, as information becomes more complex. How can we express this concept in terms of basic information, the particle, if it applies at all. 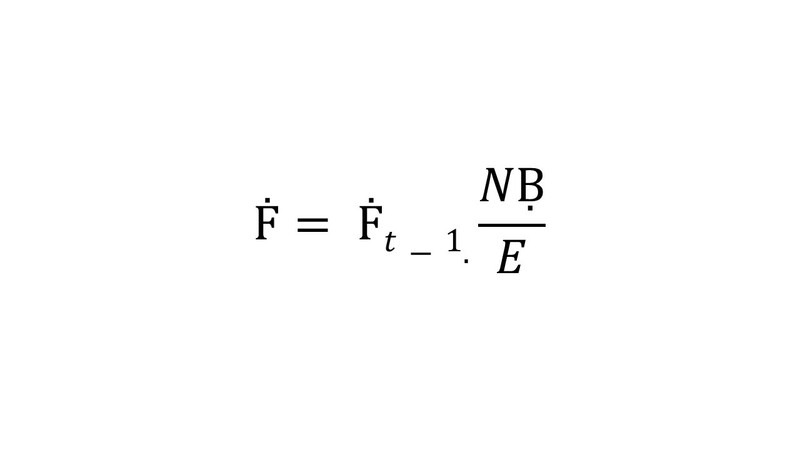 It might help to understand the second law of thermodynamics as sating that the more complex a system becomes; the less free energy is available for doing work, potential energy. The most basic information package is the elementary particle. 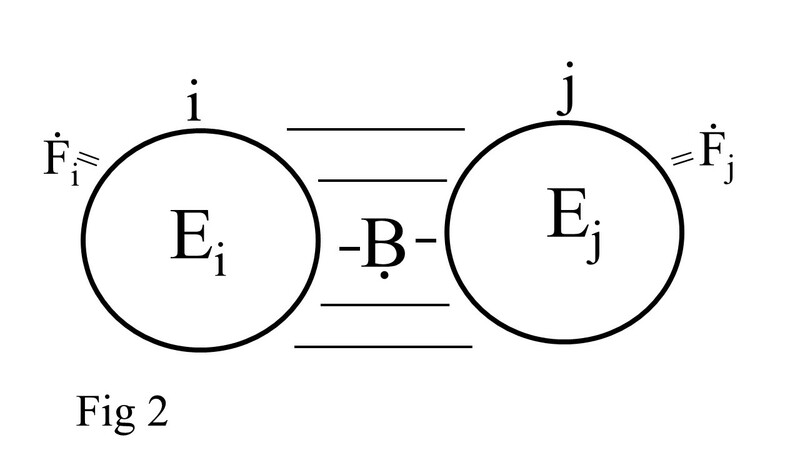 In nature, elementary particles often do not exist alone but as atoms, at least two elementary particles will create an atom, keeping things as basic as possible, we want to see entropy in particles, not to discuss terminology. 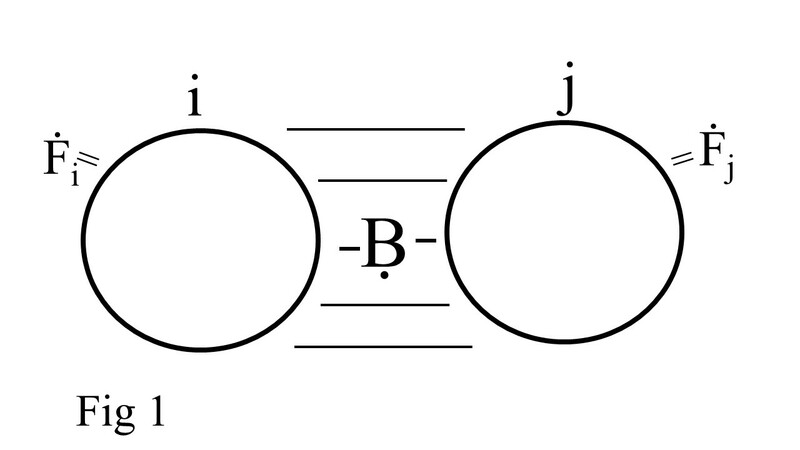 What happens when two particles get together and create a new system. Entropy should be able to help. The second law of thermodynamics basically says as information becomes more complex, more stable, the less free energy, Ḟ, is available to do work. 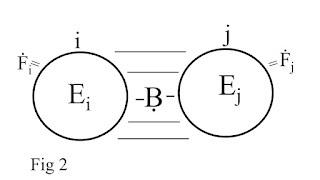 Take two particles i and j. they unite to create a system, and the resultant free energy of the system can be represented basically by equation 1. Equation 1 can be illustrated by figure 1 below. Ḅ is important energy, it is the energy that is used to hold the new system together. This energy must be sacrificed by both particles i and j. This energy was previously free but is now being used to hold the system together, that is why the more complex the information package, the more stable a system, that stability is caused by loss of free energy as it is used to hold the system together. 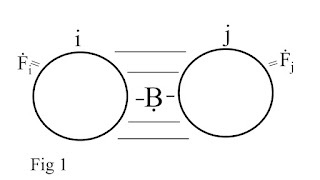 An elementary particle is a system, the most basic system. 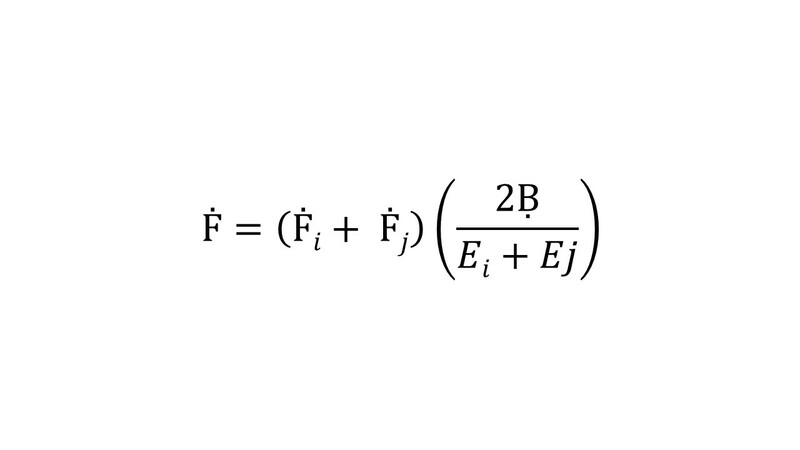 When we include total energy, figure 1 becomes figure 2. 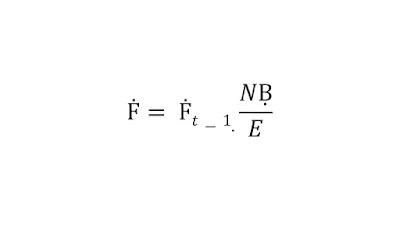 Ḟt-1 is the amount of free energy in the last time period. These thoughts where developed whilst writing an essay about information, probability and the universe.